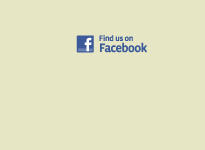 Our goal is to encourage a lifetime of health and wellness for our members. We are working with both public and private partners to provide affordable programs, services, and opportunities for the residents of Southern West Virginia. The Chief Logan Recreational Center is working to become a valuable resource for our community. The Center sits on six acres of reclaimed surface mining property. 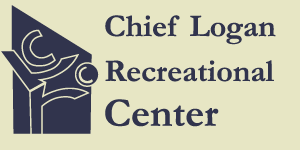 Located adjacent to the Earl Ray Tomblin Conference Center, the Chief Logan Recreational Center is working to provide our citizens unparalleled access to a better quality of life. CHIEF LOGAN STATE PARK - Another milestone in Logan County high school swimming was reached last Saturday as Chapmanville Regional High School hosted the first large-scale invitational meet at the Chief Logan Rec Center Pool. Billed as the Hatfield/McCoy Invitational, nine teams with more than 100 swimmers met in competition. Teams from Capital High School, Chapmanville, Charleston Catholic, Logan, Man, Pikeview, Riverside, South Charleston and Spring Valley filled the Chief Logan Recreational Center with fast swimming and intense competition. With the WVSSAC's Region IV tournament only weeks away, all the swimmers were intent on lowering their times for the best seed possible and are working hard for a chance to compete at the WVSSAC State Championship Tournament in Morgantown. Athletes from across the county performed well at the meet with swimmers from Chapmanville, Logan and Man all posting new personal best times and finishing in the top five in many events. 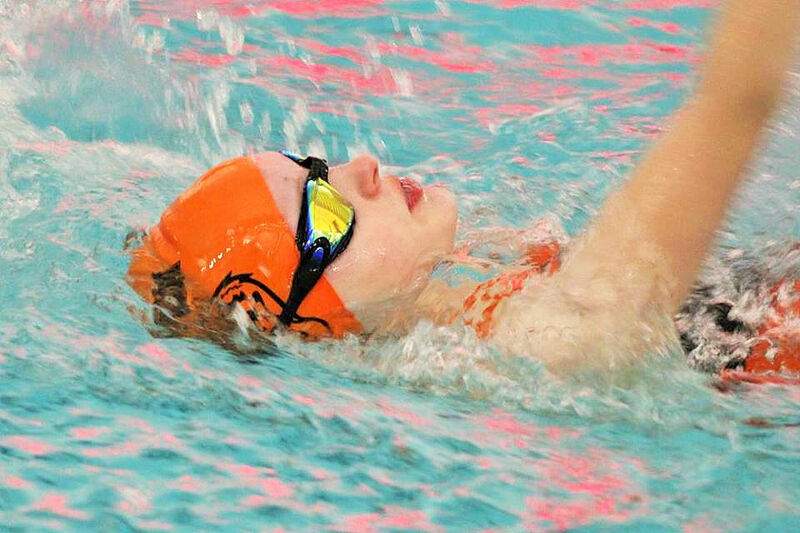 Chapmanville freshman Alex Carver posted a personal best in the 200-yard Individual Medley with a time of 2:39.82, and a personal best in the 100-yard backstroke with a time of 1:12.24. Senior Ben Chapman posted a new personal best in the 100-yard freestyle with a time of 1:16.42. Senior Quincy Farley posted a new personal record in the 100-yard breaststroke with a time of 1:16.06. Senior Amber Richards posted a new personal best in the 100-yard backstroke with a time of 1:45.44. CRHS senior Payton Stamper posted a new personal best in the 50-yard freestyle with a time of 0:41.09, and in the 100-yard freestyle with a time of 1:31.37. Freshman Lauren Workman posted a new personal best in the 100-yard breaststroke with a time of 1:29.78. Farley took first place in the 200 Individual Medley, while Carver was third in the same race. Junior Connor Marcum finished fourth place in the 100 freestyle. Chapmanville Regional finished the day with a combined score of 187 points, finishing in sixth place overall. The CRHS boys team scored 129 points and took sixth, while the CRHS girls' team scored 58 points and took seventh place. The Man Aqua Billies closed out the day with a combined score of 135 points, taking eighth place overall. The Man boys had 69 points and were seventh, while the Man girls tallied 66 points and were sixth. The Logan Water Cats had 136 points, taking seventh place overall. The Logan girls scored all 136 points and were fifth place in the girls' standings. Man senior Richie Caserta posted a personal best in the 50-yard freestyle with a time of 0:24.22. Junior Nijule Sharp posted a personal best in the 50-yard freestyle with a time of 0:27.07. Caserta took first place in the 50 freestyle and also the 100 breaststroke. Junior Dana Goodman finished in first place in the 200 Individual Medley and was also first in the 100 butterfly. For Logan, junior Emily Ball posted a personal best in the 100-yard freestyle with a time of 1:06.58. Sophomore Caydence Bevino posted a personal best in the 500-yard freestyle with a time of 9:47.22. Logan freshman Rosey Gillette took second place in the 200 freestyle and third in the 100 freestyle. Ball finished in fourth place in the 100 freestyle, and Bevino was fourth in the 500 freestyle. "I hope that this can become an annual tradition," Chapmanville swimming coach Linley Marcum said. "A meet like this has been a long time coming, and it feels great to finally be able to host meets of this size. I hope that in years to come the Hatfield/McCoy Invitational will only grow and more teams will take advantage of this meet opportunity in southern West Virginia." Marcum said a lot of people made the meet run so smoothly. "I would like to thank the Logan County Board of Education for the purchase of the software that made this meet possible," Marcum said. "I would also like to thank White Eye Care of Logan and Pannell Swim Shop of Lexington, Kentucky for their sponsorship of the meet. And of course, without the support of the Chief Logan Recreational Center, none of this would be possible. It certainly takes a team to make a meet like this happen, and without any of these people, a meet like this couldn't happen. I couldn't be more pleased with the community and county support of our swim teams at Chapmanville Regional, Logan and Man high schools." Chapmanville is scheduled to host the Cardinal Conference Championship Swim Meet on Saturday, January 26 at 1:30 p.m. at the Chief Logan Recreational Center. This is the first ever Cardinal Conference meet and teams from Chapmanville, Logan, Nitro, Winfield and Sissonville will meet in competition. "I invite the county out to experience a swim meet at the Chief Logan Recreational Center," Coach Marcum added. "The athletes involved in high school swimming really appreciate the support of their community, and are proud to swim for their respective schools. The Cardinal Conference Meet is an historical event and CRHS Tiger Swim is proud to be hosting." 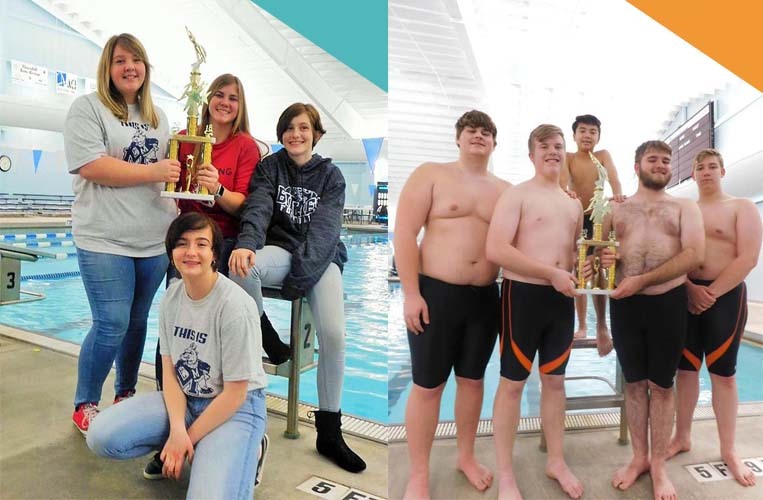 The Chapmanville Regional High School boys and the Man High School girls were crowned champions as the Logan County Swimming Championships were held recently at the Chief Logan Rec Center pool. Chapmanville's Amber Richards and Tara Christian logged personal best times in the 50-meter freestyle. Lauren Workman also posted an improved time in the 100-meter breaststroke. Man's Dana Goodman also had a personal best time in the 100-meter backstroke, while Nijule Sharp posted a personal record time in the 100-meter backstroke. Freshmen Faith Imes, Olivia Lusk and Destiney Trent all posted personal best times as well. During the meet, the seniors from Chapmanville and Man were also recognized. Logan High School has no senior team members. The county meet was hosted by Chapmanville Regional High School. "I'm proud to host this meet for the teams of the county," Chapmanville coach Linley Marcum said. "It's always exciting to see the camaraderie and competition within the county. It's always a fun and exciting meet." Quincy Farley is headed to the state swim meet. And so are four other Logan County swimmers. Farley, a junior member of Chapmanville Regional High School's Tiger Swim team, turned in a good enough time in Saturday's Class AA Region 4 swimming championships at Marshall University's Frederick A. Fitch Natatorium to advance him to the upcoming state meet, set for February 15-16 in Morgantown. Farley qualified in the 200-yard individual medley, tying him for 18th in the state. He swam the event in 2:23.77 in the regionals and also logged a time of 1:05.40 in the 100-yard butterfly. The regional meet closed out the season for Tiger Swim except for Farley, who will be making a second trip to the state tournament. It's been a great year for high school swimming in Logan County in general this year, Marcum said. With the addition of Logan High School's Water Cats, Logan County had all three high schools competing this year along with Man High School's Aqua Billies. The three teams met last month in the first ever Logan County Championships, held at the Chief Logan Rec Center pool. Man High School's Dana Goodman qualified for state in the 200 IM and the 100 free style. Man's Richard Caserta moved on to state in the 50-yard freestyle. Logan High School's Zachary Lowes (100-yard butterfly) and Emily Ball (100-yard backstroke) also qualified for state. "Swimming in Logan County has come a long way in three years from Chapmanville's establishment during the 2015-16 season, to the establishment of Man's team last year, and Logan's team this year," Coach Marcum said. "All three county teams have children attending the state tournament this year, and if that isn't proof that Logan County needs swim teams in the high schools, I don't know what is." Others on the Chapmanville team also competed in the regional meet. Senior Siara Conley swam in the girls' 200-yard IM (3:03.16) and the girls' 200-yard freestyle (1:12.87). Both were personal best times. "Siara plans to attend Bethany College after graduation to study veterinary medicine, and she will be swimming for Bethany College," Coach Marcum said. Senior Kaitlin Sparks swam in the girls' 50-yard freestyle (0:47.82). "This time was a personal best for Kaitlin, something she has fought hard to achieve," Marcum said. "Kaitlin plans to join the Special Olympics after graduation to represent Logan County and West Virginia in the swimming pool." CRHS junior Ryan Satterfield took part in the boys' 200-yard freestyle (2:33.52) and the boys' 100-yard freestyle (1:10.17). Amber Richards, a junior, swam in the girls' 50-yard freestyle (0:40.15) and the girls' 100-yard freestyle (1:29.98). Sophomore Leeta Adkins took part in the girls' 50-yard freestyle (0:41.37) and the girls' 100-yard freestyle (1:35.78). Both times are new personal best times. Conner Marcum, a sophomore, swam in the boys' 100-yard freestyle (1:00.71) and the boys' 100-yard backstroke (1:08.94). Both times are personal bests. Connor Farley, a freshman, participated in the boys' 50-yard freestyle (0:29.91), swimming to a new personal best time. Freshman Aisha Ojeda swam in the 50-yard freestyle (0.36.16) and the girls' 100-yard freestyle (1:26.61), swimming to two personal best times. The CRHS girls' relay team of Sparks, Adkins, Richards and Conley swam the 200-yard freestyle in 2:41.40. Farley, Satterfield, Farley and Connor Marcum swam the boys' 200-yard freestyle relay in 1:58.13. The swimming results for Man and Logan were not available. Coach Marcum said he's looking forward to next season and a bright future ahead for CRHS swimming. 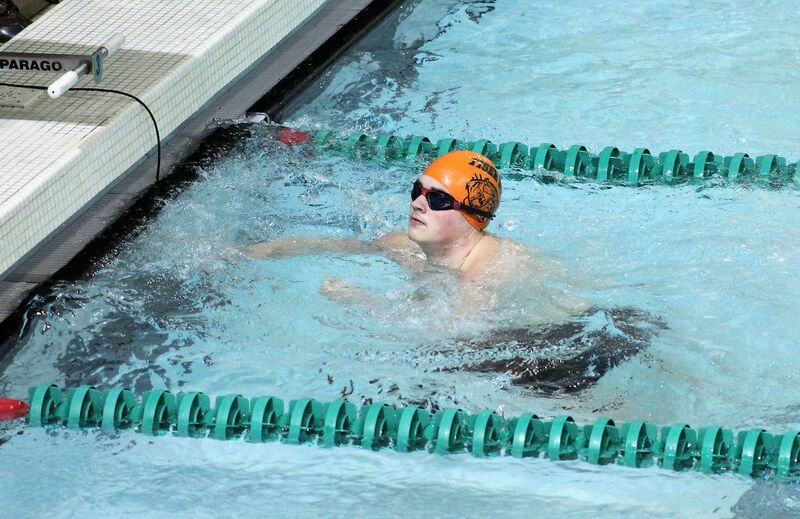 "I look for great things from Chapmanville Regional High School swimming in the 2018-19 season," Marcum said. "If this year is any indication, our swimmers will be regular attendees at the West Virginia State High School Swim Championships. Throughout our season we compete in a very fast region, so our kids are put to the test not just during the Region IV Tournament, but beginning with their very first meet. Fast times, extreme effort, and dedication makes the Tiger Swim program competitive from the first stroke to the last."